Master Builders South Africa is the leading national representatives body in the building and construction industry in South Africa. It is a voluntary membership based organization whose primary role is to promote the viewpoints and interests of the industry, to promote the highest quality and standards through excellence in service to our members of the industry, to promote the highest quality and standards through excellence in service to our members, engaging government and legislative bodies on national policies that effect the industry, for the purpose of creating a sustainable building industry in South Africa. IWH is to ensure that members provide reliable equipment and services for safe and efficient work at height. This can be achieved by the following broad objectives: Providing a unified voice for the Industry. Setting and maintaining industry standards. Promoting the awareness of the Industry. Developing guidelines and frameworks for skills development of industry players and the education of end-users. TIPSASA focuses on the Thermal Insulation Industry with particular emphasis on energy efficient products and systems. As a non-profit company it continues to serve its members, professionals and consumers. The Waterproofing Association of Gauteng (WAG) is dedicated to the promotion, support and protection of the common interest of Specifying Authorities, Clients, Contractors and Manufacturers to ensure professionalism, integrity as well as reliability within the Waterproofing Industry. The Corrosion Institute of South Africa (CorrISA) exists to serve a broad spectrum of stakeholders with an interest in controlling the impact of corrosion on asset lifecycles, productivity and human lie. These anti-corrosion experts ensure that legacies are preserved, economic imperatives are achieved ad that human lives are enriched and safeguarded in the process. Registered in accordance with the provisions of the Occupational Health & Safety Act, Act 85 of 1993, as amended and the Asbestos Regulations. 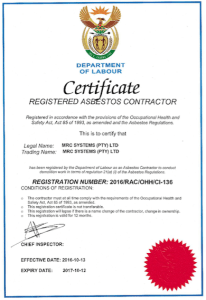 We are registered by the Department of Labour as an Asbestos Contractor to conduct demolition work in terms of regulation 21(a) (i) of the Asbestos Regulations. 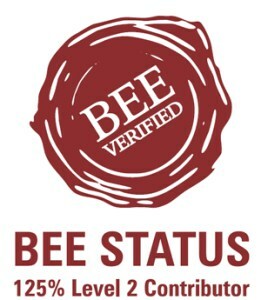 Broad-Based Black Economic Empowerment (B-BBEE) is a specific government policy to advance economic transformation and enhance the economic participation of black people in the South African economy.